Just when you think a bed can't convert any more than 4 ways, they come out with a 7-in-1 conversion bed! Wow! The Dream On Me Violet 7-in-1 Convertible Life Style Crib will grow with your child. It starts out as a crib with 3 mattress height settings, and then it can be converted into a toddler bed. The toddler bed guard rail is sold separately. When your toddler outgrows his or her bed, you can convert this into a daybed by removing the front rails from the crib and assembling the bottom bar, after you adjust the mattress height. Next, you have two options for a youth bed conversion, either with or without a foot board option. The youth bed conversion kit that is required for the foot board is sold separately. The last conversion options are a full-sized bed, with or without the foot board option. The full bed conversion kit is required for the foot board. It is also sold separately. Also sold separately is the mattress. When picking out a mattress, make sure to get one that fits the Dream On Me Violet 7-in-1 Convertible Life Style Crib snugly. A gap in between the mattress and crib frame is a safety hazard for your baby. A common question that has surfaced again and again, is "Do the sides drop down?" All cribs that had sides that dropped down have been recalled due to safety standards. The Dream On Me Violet 7-in-1 Convertible Life Style Crib also does not have drop down sides. It's important to be careful when accepting a hand me down crib if it has drop down crib sides. Even though they have been pulled from store shelves, you can still find them at garage sales, unfortunately. This is one of the most inexpensive conversion cribs on the market. If you are looking for an economy crib, then you've come to the right place with The Dream On Me Violet 7-in-1 Convertible Life Style Crib. "The one thing we were a bit disappointed with, was realizing at the very end that the toddler guard rail needs to be purchased separately! That's mainly my fault for not reading the fine prints. But,this bed cost me a bit over $100 and the guard rail will cost me $50?! come on. deduct 1 star." "The packaging is slightly deceiving. It does convert into a toddler bed, but the side rail piece shown on the box and in the instructions is not included. I spent a good ten minutes looking for the part thinking we had misplaced it or left it in the box when we opened it. After reading the instruction manual, we realized the part is not included. Otherwise I am pleased with the purchase." "This crib is VERY heavy and I recommend assembling it with 2 people. I'm 31 weeks pregnant however, so this was a little harder for me. There are no extra pieces so make sure not to lose any! Once assembled, this product is VERY sturdy and I love that the mattress level can be adjusted to so many different heights. It's a bit of a hassle though, so make sure when you put it together that it's the height you want it. 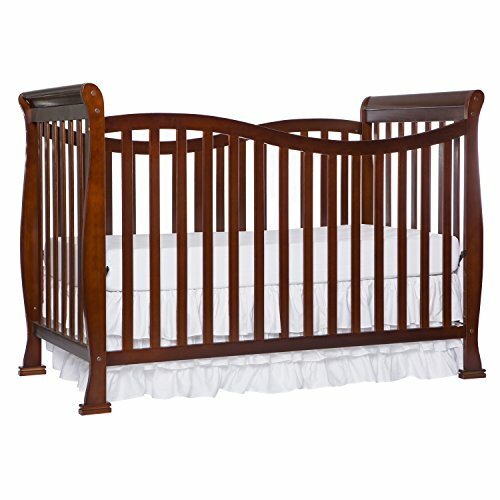 This crib is absolutely gorgeous, sturdy, and of exceptional quality for the price. Definitely recommend!" "I didn't like the packaging that the assembly parts came in. Would have been better if they were in bags, but chances are you're gonna end up hunting around for a nut or screw anyways so it wasn't all that bad." Another had this to say, "The assembly was very easy, put this together with my stepson but probably one person can put it together without any help. The whole process took about 30 minutes and all the tools are included." For an economy priced crib, the Dream On Me Violet 7-in-1 Convertible Life Style Crib has a fancy almost Victorian look to it. For this price it's nice to get a little style for your buck. Most parents were very pleased with how The Dream On Me Violet 7-in-1 Convertible Life Style Crib looked in their nursery. The Dream On Me Violet 7-in-1 Convertible Life Style Crib is a good, solid, and sturdy baby crib that is priced low. It is an easy crib to put together. It converts 7 different ways, which is cool and also economical. Keep in mind that you won't need to buy a toddler crib or older child bed if you buy the conversion kits. In the long run, this will save you money. If you are looking for a low priced, durable crib, I don't think you can go wrong with The Dream On Me Violet 7-in-1 Convertible Life Style Crib. To read the rest of our baby crib reviews, check out our article, The Top 10 Baby Cribs of 2018.